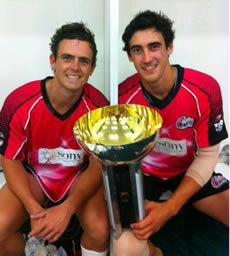 Both Steve O’Keefe and Mitchell Starc have re-signed with the reigning KFC Big Bash Champions, the Sydney Sixers. This is fantastic news for the pair and the Sixers as they look to further their success from last year and win consecutive Big Bash titles. “I owe the Sixers a lot. They looked after me last year when I was injured and missed half the season, so I would like to think I’ve been loyal in that respect. Hopefully we can produce the same goods as we did last year.” Steve said after been approached to play for the Sydney Thunder. The Sixers squad heads to South Africa in October to compete in the highly contested Twenty20 Champions League, followed by the KFC Big Bash League starting in Australia early December.